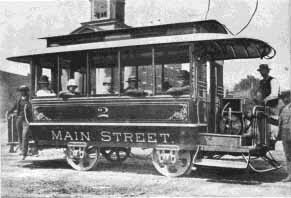 After the success of lighting several homes in Appleton a group of businessmen led by the honorable Judge J. E. Harriman decided to explore the possibilities of having a streetcar in Appleton. 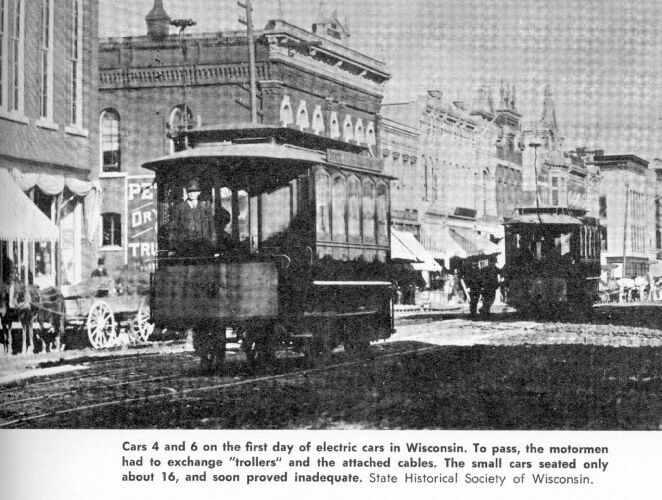 Harriman had seen a demonstration of the electric streetcar in Alabama and immediately raised $35,000 to start funding in Appleton. The men organized the Appleton Electric Railway in 1885 and in March of 1886 they bought a lot along the Fox River for another hydroelectric plant. The only proven system at this time was the Van Depoele system and that firm contracted with the city to build a dynamo and distribution system for the railway. The first cars were built by the Pullman Company in Chicago. All five cars were fitted with the direct-tapping controller and a troller to be used on the double wired system. Operations began on August 16, 1886. When two cars passed each other the trollers had to be unhooked and passed to the other cars. The cars did not hold a lot of people and the 10 horsepower caused the closing of a branch line because the cars could not go up the hill. The main route began in the flats area on Oneida St, went up the hill to College Ave, went along Rankin and ending the loop trip at the Riverside Cemetary. It returned to College, then south on State to Prospect, north on Mason St and returned downtown. By 1890 the entire line ran out of money and closed down.